-Per Qwerts suggestion, I looked at the bonuses and increased Lee's bonus from 2 to 3, and increased holding all Confederate ships from 1 to 2. -The perimeter border has been increased a little and some slight changes made in the graphics. The xml and samples with armies placed are located on pg 24. I think it's right, but if anyone sees anything that needs changed please PM me or post it here. Last edited by Elijah S on Mon Dec 17, 2007 12:58 am, edited 18 times in total. How do I get the image to show on the original post? I had trouble doing this and can use a hand. Thanks! -Make the neutral terits worth 0, cause they were neutral. -Make combined the bonuses like World 2.1. For example you get 3 for Lee, 4 for Jackson, 3 for Beauregard, 1 for the navy, and maybe 14 for all of the South. Graphics: Change the colors a little cause they are very similar, and maybe change the font for the neutral. Also: wats that thing above the key? a drum? I say take the trumpet and drum out. Other than that, it looks really nice! yes elijah...i agree with unriggable and others on this one...good start and ideas coming through there. Would very much luv to see the small version at around 600px wide within size restrictions as soon as you can arrange it. try photobucket.com if your looking for a good hosting service that's free. that's what i use, adn it has lots of sapce available for your images. i use ripway.com for hosting of the xml file. Ill give better comment once the image is resized to a better viewable size. But one comment i will make is that the boarders are pixalated badly and need to be tidyed up. Civil War Map - 1st Update -Opinions welcome! -The ships have been relocated to give more of an appearance of a Union blockade. -The Legend has all been placed above a solid black background. -Owning all neutral states no longer gets a bonus. -The drum and bugle have been taken out, although I think having icons adds more of a "feel" for the era and may add something later. -The army circles have been tweaked a little to make them more visable. -Owning all Union or Confederate states gets an added bonus. I've left the font for the neutral states the same, as it has an old west look, and during the time period most of the neutral states were considered to be the wild west. The pixelation will be addressed later. -If anyone has a trick to reduce pixelation in a photoshop file I'd be glad to know! I've left out the river crossings and attack lines for the ships because I'm sure there will be opinions on where they should be located. Obviously, every suggestion can't be implemented, but I've got this file saved in a fully editable format and will make every effort to make changes I feel truly add something to the visual appearance and/or gameplay. I have read all the tips that people have given Elijah on his map. I agree with some, as far as game play and a couple minor details. I think if everyone were given the chance to play this board, they would find it quite simple. It is laid out plainly, very legible and a no-brainer. I do hope we all have the privilege to play it. However, I think the main concept here, whether this map takes off or not, is that it remains Elijah's map and does not become a collage of other people's input on what they think the design should be. I like the drum, by the way! I mean, come on, would you not play this map because it has a drum as a symbol? Good luck Elijah, I know the work you have put into this and can't wait to take someone on in this game.. The trumpet and drum were very fitting for the map. If you don't put them back right now we'll well we'll probably do nothing but yea they were good. Last edited by Elijah S on Sun Sep 23, 2007 1:58 am, edited 1 time in total. I would like to vote on this map but it isn't allowing the option to do so. I think the gameplay is very good. You may need some help on the graphics though, unless you think you can fix the pixilation on your own. Also, please stop making new topics when you update. If you want to change polls let me know and I can do it. As far as the move request. Put together a graphics update where you maybe fix some of the border's graphics with some sort of brush effect and I'll check some of the other requirements and see if I can justify moving your topic. Is the Legend easily understood? Elijah S...i'd like to see you continue this...and thanks for that first update. I think there will be good support for this. Your map is only 579 px wide at present...so think about maybe extending it to 600px to give yourself some room for a really good legend, which btw is coming together very nicely. Forgive my ignorance of your Civil War history ( i am an aussie afterall), in which state was the deciding battle? Perhaps this could be made into a gameplay feature (only a suggestion). Can you improve slightly the colour of the green army tert shadows, they are very lighton? I'd look forward to next updates. Keep up the good work...your colleagues will guide you well, but keep your style and flavour for the map in mind also. -The pixelation issue has been dealt with by making the borders smaller and reducing diagonals. -The state names are now spelled out instead of abbreviated, except a few small eastern states, where space was not adequate. -Attack lines have been drawn for the ships and across the rivers. -Bonus values have been adjusted. -The army circles are darker. -The image size was brought up to 600px wide and 499px high. -A sandstone texture was added to the states. -Memphis replaced Nashville as one of the South's key cities. -Army Numbers have been added. -Crossing swords have been placed under the title. -The Legend has been realligned. Thanks for the support Cairnswk, it would be great to see more of that in this forum. In answering your question- The decisive battle of the war was probably Gettysburg, and I could see no way to implement that into gameplay; However, Historians widely believe that it was the Union blockade, leaving the South without means to export its agriculture, which was, in the long term, the reason the Confederacy lost. -I think this has been effectively put into gameplay. cairnswk wrote: Elijah S...i'd like to see you continue this...and thanks for that first update. I think there will be good support for this. Last edited by Elijah S on Tue Sep 25, 2007 8:23 pm, edited 1 time in total. i want to create a new map but what software you use for design this map.. ? nice to have the navy element incorporated in this map. many tend to forget that the navy battles (more the blockading and breaking of it) was very important. But I would like to see the larger states divided in 2 or 3 smaller parts so that progress in the western/middle states are similar to progress in the north east states. I mean, conquering Maine in one turn now gives less sensation than conquering kansas in one turn. mapland sizes should be dictated by comparable likely military advancement per timeframe ("a turn") and not by some political demarcation. That can be straightened with the bonussystem such that a state of a couple of lands yields a bonus. You do understand what I am saying ? Oh , and can you exhange the toygun figure with something more spectacular ? A part of a painting (of gunners, cavalry, whatever..). The toy thing seems so so.. silly. Ciancama... -This map has been done entirely with Photoshop, but there are several good programs out there, most are probably much easier to learn. With 13 available bonuses, I think the gameplay should be lively, and the bonuses range from holding the 2 capitols to holding the entire North or South, which, in combination with the fact that the Nuetral States provide no bonus, and the lines of attack across the rivers, effectively promotes North - South progression. But maybe a poll regarding icons is in store later too. lt_oddball wrote: nice to have the navy element incorporated in this map. Last edited by Elijah S on Wed Sep 26, 2007 4:03 pm, edited 1 time in total. I'd like to see the drum and trumpet come back. These are two great symbols for that period. I think you could do a lot better with the bridges and water routes. If you want to wait until the locations of these are firmly set before upgrading the graphics that's fine. I'm not sure if you have a reason for not having the confederate ships touch the coast, but I'd like to see at least one of em touch. Maybe have CSS2 connect to Miss. ? I liked the independents having a bonus, but I guess 13 bonuses is plenty. I like the idea of having one of the south's ships touching land... hadn't even thought of it. As for the bridges and water routes I'm open to ideas. edbeard wrote: I'd like to see the drum and trumpet come back. These are two great symbols for that period. 3rd Revision *Note*- River crossings and sea attacks are being worked on. 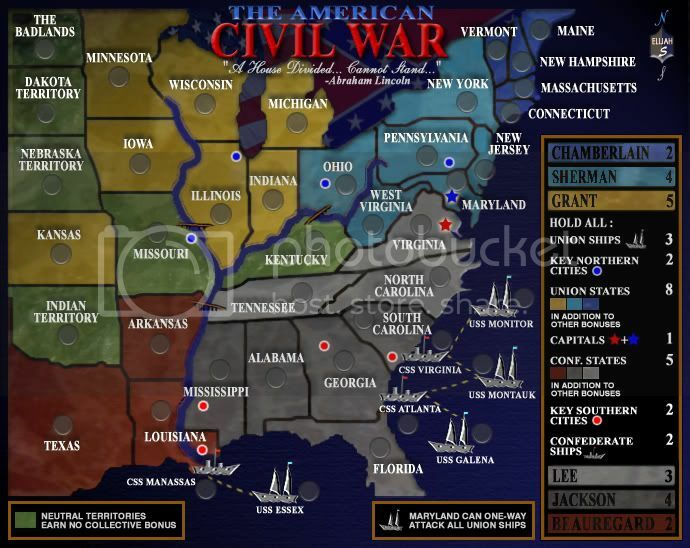 -Moved 2 Confederate ships to touch land. -Re-alligned the Legend (again). I think this Legend is easy to read and less obtrusive than prior versions. -Placed Union and Confederate flags in the background. -Created ripples in the foreground to give the map greater depth. I liked the trumpet and drum from the first version, but think that, with the addition of the background flags, if I place too many icons the map will begin to look busy. Regarding the river crossing and sea attacks, I'm working on coming up with something that looks good without detracting from the background. Last edited by Elijah S on Wed Jul 15, 2009 12:54 am, edited 1 time in total.